HD CLEANER is a powerful caustic detergent degreaser formulated for safe and effective removal of heavy grease and soil deposits encountered in kitchen, food preparation areas, plant, machinery and workshops. HD CLEANER has excellent foaming and cleaning characteristics ideally suited to cleaning heavy oil and grease spills from masonry paving, diesel fumes, road grime, bbqs, ovens, truck engines and bodies. • Always wear Personal Protective Equipment (PPE) – A minimum requirement of Safety Glasses, Gloves & Boots. Damage to clothing may occur. 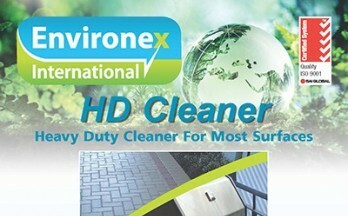 • Mix HD CLEANER at 50 ml per 1 Litre of hot water. Flood the affected area and allow to react for 2-3 minutes. Scrub with an ENVIRONEX EAGER BEAVER, then mop off. • The area must be rinsed with REFRESH pH neutral detergent to remove any residue. • Always test first.